Cape May firefighters and lifeguards formed a human chain to save a distressed swimmer who had tried to rescue three other swimmers. The three swimmers were safely back to the beach by the time rescuers arrived. Rescuers formed a human chain to help save a man who first tried to help several struggling swimmers return to shore in Cape May Friday afternoon. A caller alerted the Cape May Fire Department to a water rescue close to Beach and Philadelphia avenues around 5:45 p.m. Friday, the Cape May Fire Department announced on its Facebook page Saturday morning. The three swimmers who initially struggled to return to shore were safely out of the water by the time firefighters arrived, but the person who had tried to rescue them was in trouble, authorities said. 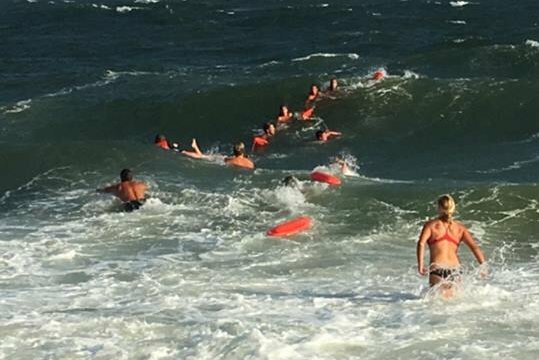 Newsworks.org reported that two members of the fire department joined off-duty beach patrol members to form a human chain and bring the person back to shore. Firefighters and Cape May police officers used a retrieval line to bring those who took part in that rescue safely back to the beach, authorities said. Facebook user Mary Beth Hamilton McLoughlin witnessed the rescue and wrote about it in a post to the Facebook group Cool Cape May, according to Newsworks. "The tremendous effort of all those involved was absolutely breathtaking," she wrote, calling it one of the most impressive sights she has witnessed. The United States Coast Guard, which has a base and training center in the resort town, was also reportedly on the scene and helped out with the rescue. The four swimmers were reportedly taken for evaluation to Cape Regional Medical Center in Cape May Court House.